Richard Rothstein’s post today on the Educational Policy Institute web site clearly describes how US education policy in recent years (e.g., the No Child Left Behind Act) has destroyed schools as places of learning. There is no doubt NCLB is a failed policy by any standards you want to invoke (see, for example, Larry Stedman’s comprehensive assessment of NCLB in the open-access journal Critical Education or Rothstein’s American Prospect article from 2007). But, NCLB’s failure is not Rothstein’s point today. Rather, his point is how Obama and his education secretary Arne Duncan have responded to this massive failure of policy making … by prescribing more of the same. States will be excused from making all children proficient by 2014 if they agree instead to make all children “college-ready” by 2020. If NCLB’s testing obsession didn’t suffice to distinguish good schools from failing ones, states can be excused from loss of funds if they instead use student test scores to distinguish good teachers from bad ones. Without any reauthorization of NCLB, Mr. Duncan will now use his waiver authority to demand, in effect, even more test-prep, more drill, more unbalanced curricula, more misidentification of success and failure, more demoralization of good teachers, and more needless stress for young children. But the damage being done to American public education has now gone on for so long that it will have enduring effects. Schools will not soon be able to implement a holistic education to disadvantaged children. Disillusioned and demoralized teachers who have abandoned the profession or have retired are now being rapidly replaced by a new generation of drill sergeants, well-trained in the techniques of “data-driven instruction.” This cannot easily be undone. Politicians, the ruling class, and the mainstream media are impervious to the mountains of evidence illustrating how NCLB stripped the heart and soul of learning and teaching in US schools and failed in any measure to “increase achievement” (see Stedman’s work). But is NCLB really a policy failure? Perhaps not. Like the trail of death, destruction, and terror left in the wake of America’s imperialist wars, educational destruction created by NCLB is just so much collateral damage in an education agenda that is war agenda. 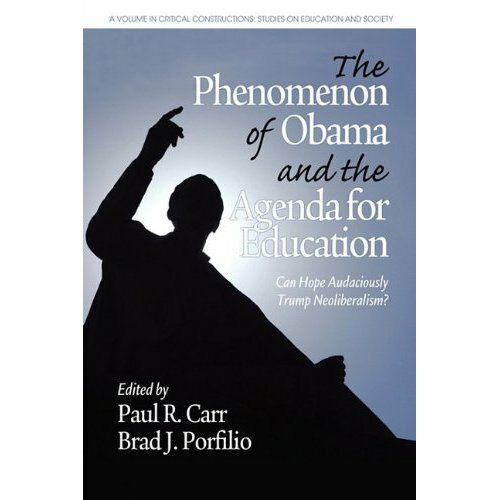 New book: The Phenomenon of Obama and the Agenda for Education Can Hope Audaciously Trump Neoliberalism? As for the question contained in the title of the book–Can hope audaciously trump neoliberalism?–, Carr and Porfilio develop a framework that integrates the work of the contributors, including Christine Sleeter and Dennis Carlson, who wrote the forward and afterword respectively, that problematizes how the Obama administration has presented an extremely constrained, conservative notion of change in and through education. The rhetoric has not been matched by meaningful, tangible, transformative proposals, policies and programs aimed at transformative change. There are many reasons for this, and, according to the contributors to this book, it is clear that neoliberalism is a major obstacle to stimulating the hope that so many have been hoping for. Addressing systemic inequities embedded within neoliberalism, Carr and Porfilio argue, is key to achieving the hope so brilliantly presented by Obama during the campaign that brought him to the presidency.